At Aacme Glass, our glass balustrades are designed with more than just safety in mind. Our fantastic range of glass supplies combines quality, choice and competitive prices, giving you the best deal around. At Aacme Glass, we are able to supply, fit and repair all internal glass balustrades. We are also extremely proud to offer competitive prices, so you can enjoy your beautiful brand new glass balustrade at a fraction of the cost. Our range of internal glass balustrades bridges functionality with design. We’re able to create an area with free-flowing light and even give the illusion of greater space. What is more – they are extremely easy to clean and maintain, and can really bring your home to life. Get in touch with our specialists today on our website who can talk you through your vision and make it come to life. Materials for glass balustrade fittings will vary depending on the type of balustrade glass you wish to install, the size of the glass bannister, and whether you will be having a frameless glass balustrade. 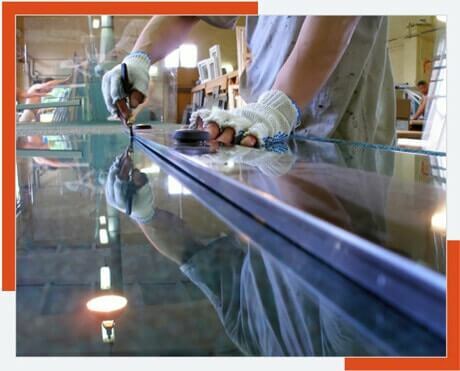 General safety regulations control how much weight each section the glass railing can support, which will often determine the need for panel clips and mouldings. Glass balustrading keeps up with modern interior decoration and styles. Glass Balustrading will add a touch of class and elegance to any home. Our dedicated team can provide quality glass balustrades to fit your exact specification. Our team can ensure everlasting style, safety and functionality. If you would like more information contact us today. Glass balustrades are strong, durable and long-lasting meaning, in the long run, this reduces costs massively as breakages are unlikely. They have a modern, premium and timeless appearance! They will never go out of style. On the more practical side, they are very easy to clean. All they need to be clean is a cloth which can wipe away any smudges dirt. Cleaning your window will restore your balustrading back to it’s clear and transparent look. Glass balustrading is not only pleasing to the eye but glass balustrades can provide a view of the outside world that is not unobstructed in any way. Glass can allow natural light into a space making it look a lot bigger and give the room a more natural feel to it. Glass is often a lot stronger and more durable than most other materials. Meaning glass balustrades are very safe and have a good reputation for use in a commercial or domestic setting. Here at Aacme Glass, we can provide glass balustrades made to order. We will work closely with you to understand your exact requirements and work to the specification provided to help you create what you have envisioned. If you would like more information about our glass balustrading or how it can be used in your home today. Please feel free to get in touch with us and we would be more than happy to answer your questions on our website. For the perfect internal staircase or landing; our stunning balustrade glass is made to measure in any size and shape you need. So the sky’s the limit when it comes to bringing your architectural design ideas to life! From internal staircases to beautiful landings, our customers have transformed their home with our balustrade glass for countless projects throughout Newport, Cardiff and all surrounding areas. Proud of your balustrade designs? We would love to see them, send in your project photos and we’ll display them in our gallery for all to see!